India will seek to exploit the batting slump of some of Australia's key batsmen when they clash with the world champions in the first of the best-of- three cricket tri-series finals here tomorrow. South Africa tightened the noose around Bangladesh after posting a huge first innings score on a record-shattering second day of the second Test here today. After declaring their first innings on 583-7, the visitors reduced the home team to a shaky 60-3 at close to raise hopes of a complete mauling of their struggling rivals. South African skipper Graeme Smith and Neil McKenzie rewrote history books here today when they broke a long-standing world record for the best opening stand ever. The young guns did it in 2000. And did it in style. Down in the dumps while chasing a modest total against the hosts Sri Lanka in the Under-19 World Cup final eight years ago, Reetinder Sodhi authored a fairytale script for the colts. The Patiala all-rounder, later adjudged man of the match, rose to the occasion as India recored a sensational five-wicket victory. South Africa set up a title clash against India in the Under-19 cricket World Cup after crushing defending champions Pakistan by 98 runs under Duckworth/Lewis method in the rain-affected second semifinal here today. Delhi, Punjab and Haryana registered victories in the North Zone one-day cricket matches here today. 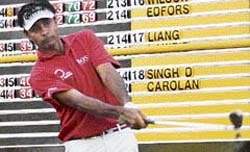 A resolute Jyoti Randhawa put himself in title contention by climbing to the tied second spot but it was heartbreak for veteran golfer Gaurav Ghei who was disqualified under bizarre circumstances on day three of the $2.5 million Johnnie Walker Classic here today. World Champion Viswanathan Anand maintained his lead after the ninth round of the Morelia-Linares International Chess tournament as he split points with Grandmaster Levon Aronian in a short but exciting game. Australia's batting has been their Achilles' heels with their middle order, notably captain Ricky Ponting and Andrew Symonds, coming a cropper against the subcontinental rivals in the league stage. Apart from the century he scored in Australia's last game against India, Ponting has been carrying the form slump from the Test series while Symonds has notched up only one half century in eight matches. Matthew Hayden, who was recently reprimanded by his Board for calling Harbhajan Singh a "little obnoxious weed," has also not fired at the top, having scored just one half century and one in the 40s in the seven outings he has played in the tri-series. This is a perfect setting for a confident young Indian side to cash in on their rival's weak point and and hope to put it across the home team. Never in the 30-year-old history of the triangular series have Indians managed even a solitary win in the finals against the hosts. India's three previous experiences - in 1985-86, 1991-92 and 2003-04 - had resulted in straight drubbings but Australia's slipshod form this season promises a turn for the better for the Indians. A strategy to keep the likes of Ponting and Symonds silent could mean India again opting for a five-bowler theory tomorrow, which could mean Virender Sehwag cooling his heels in the dressing room. 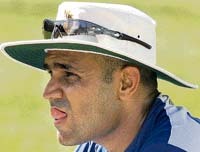 Despite India's poor starts in this competition, and Sehwag's ability to win matches of his own, Mahendra Singh Dhoni does not appear to be entirely convinced of the ability of the Delhi dasher to turn the heat on in the finals. His belief has only gained ground with the success of his bowlers. The latest recruit Praveen Kumar covered himself in glory in Hobart where he won the man-of-the-match award against Sri Lanka with a four-wicket burst. Dhoni himself has been in excellent form, claiming record 16 dismissals in eight matches which has been the most any Indian stumper has managed from a series. The previous mark of 15 scalps belonged to Rahul Dravid during the 2003 World Cup. One of the quiet but outstanding success of the tour for the Indians has been middle-order batsman Gautam Gambhir who is already on top of the heap with a tally of 423 runs at 70.50 from the league stage. His crisp hitting and marvellous running between the wickets has given him scores of 39, 102 not out, 21, 35, 34, 15, 113 and 64 not out from eight outings. Encouragingly for India, Sachin Tendulkar has given indications of returning to form with that quickfire 63 against Sri Lanka. Tendulkar has a personal mission to chase in the finals for this is his last opportunity to strike a century in a one-day international in Australia. Ironically for all his unprecedented success, Tendulkar hasn't managed a hundred in 20 outings against Australia all these years; nor one against other teams in 38 matches in all he has played on Australian soil. Numbers also have piled up for India not with bat, ball or in field alone. Indians also have been booked the most by match referees this summer. Four have been reported and three have been found guilty. Dhoni came close to being hauled up for using illegal wicketkeeping gloves before being let off with a reprimand alone. The bad blood between the two teams has ensured that not a seat at the SCG would be vacant tomororow. Match referee Jeff Crowe, and the two umpires, would have to really strain hard to stop things getting out of hands in the middle. Hayden is an automatic starter and his duel with the Indian bowlers, and fielders, would carry a spark of its own. Ricky Ponting and Andrew Symonds too should be subject to special attention in the field from the Indians, as it would be the likes of Harbhajan Singh and Sreesanth from the Australians. Shahriar Nafees was batting on seven with Abdur Razzaq on eight when stumps were drawn after an exciting day at the Chittagong Divisional stadium. Impressive Dale Steyn polished off the cream of the Bangladeshi batting with figures of 24-3 off eight overs to complement the effort of double centurions Graeme Smith (232) and Neil McKenzie (226). The duo had created history in the third over of the day when they broke the world record of 413 runs for the best opening stand, which was held by India's Pankaj Roy and Vinoo Mankad against New Zealand in 1956. Smith and McKenzie set a world record of 415 for an opening stand. Steyn, who rattled the Bangladeshi openers with some real short-pitched stuff, first claimed Tamim Iqbal when he was caught in the slips for 14. 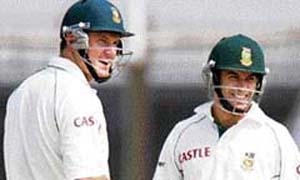 Junaid Siddique (18) then became Steyn's 100th victim in only his 20th Test when he was caught behind by Mark Boucher who also sent back captain Mohammad Ashraful for a first-ball duck to throw the Bangladeshi innings into turmoil. Fall of wickets: 1-415, 2-514, 3-515, 4-519, 5-524, 6-579, 7-583. Bowling: Mortaza 28-6-92-0, Hossain 25-1-107-3, Rafique 44.1-5-132-2, Razzak 31-1-129-1, Hasan 25-4-68-1, Ashraful 3-0-20-0, Ahmed 5-0-18-0. Fall of wicket: 1-39, 2-49, 3-49. The duo surpassed the 413-run partnership between India's Pankaj Roy and Vinoo Mankad set in Chennai in 1956 against New Zealand, on the second day of the second Test against Bangladesh at the Chittagong Divisional Stadium. The skipper celebrated the milestone, reached when he took a single off Shakib Al Hasan, by shaking hands with his opening partner in the middle. The pair also received a standing ovation from the South African dressing room and the home crowd. Their stand however came to an end just two runs later when Smith was bowled by left-arm spinner Abdur Razzaq for 232 that came off 277 balls and included 33 fours and a six. The young guns did it in 2000. And did it in style. Down in the dumps while chasing a modest total against the hosts Sri Lanka in the Under-19 World Cup final eight years ago, Reetinder Sodhi authored a fairytale script for the colts. The Patiala all-rounder, later adjudged man of the match, rose to the occasion as India recored a sensational five-wicket victory. His was the most crucial contribution that enabled the Mohammad Kaif-led side to lift the glittering trophy. Now again the Indian youngsters, skippered by Virat Kohli, have a chance to repeat history at Kuala Lumpur tomorrow. The last time they reached the final after 2000 was in 2006 when Pakistan pulled the rug from under their feet and emerged champions. The Pakistanis were thrashed by South Africa in the semifinals today. Now the moot question is whether the Indian teens will again be able to repeat history and win the World Cup, when they take on South Africa in the final tomorrow. Conversation with Reetinder Sodhi revealed how a talented and motivated bunch of boys fought valiantly and created history in 2000. Chasing an achievable target of 170-odd runs in the final, India were in dire straits at one stage, having lost 5 wickets with just 90 runs on the board. In irresistible form, Reetinder steadied the ship along with Neeraj Patel of Gujarat. Sodhi remained unconquered at 39, while Patel hit an unbeaten 35 to steer India home without any further loss of wickets. Showing all round prowess, Reetinder had earlier bowled a dream spell (10-1-26-0) to restrict Sri Lanka to a reasonable total. He was electric in the field, effecting a run out and completing a remarkable catch. Earlier, in the semifinal match against Australia, Yuvraj played a scorching innings. Known for his penchant for extravagant strokes, the left-handed Chandigarh batsman notched up a whirlwind half century at more than run a ball. It was this knock which proved decisive as India outplayed Australia to storm into final in a convincing fashion. Yuvraj was impressive throughout the tournament. Belting bowlers at will, the powerful hitter, now vice-captain of the Indian ODI team, was adjudged man of the series. Along with Reetinder and Yuvraj, Manish Sharma and Ravneet Ricky, both Punjab Ranji Trophy players hailing from Amritsar, also displayed their prodigious talent. Kaif led from the front hitting a couple of gutsy knocks, besides being the most agile on the field. The Indian colts remained unbeaten throughout the tournament. South Africa needed 20.4 overs today, after a delayed start of two hours and 20 minutes due to wet outfield, to skittle out Pakistan for 153 in a total of 39.3 overs after the game was carried over to the reserved day due to bad weather yesterday. Pakistan, the 2004 and 2006 winners, were unlucky to bow out of the tournament after needing only five runs in seven balls if the stipulated 20 overs had been bowled yesterday. Pakistan were 86 for 2 yesterday while chasing revised target of 252 from 47 overs under Duckworth/Lewis method following a brief rain interruption after South Africa made 260 for eight in their allotted 50 overs. Off-spinner Mohammad Vallie returned 4-25 for South Africa as opener Ahmad Shehzad played a lone hand for Pakistan with a fluent 60 containing six boundaries and a six before he was dismissed yesterday. India will take on South Africa in the day-night final tomorrow at the Kinrara Oval with a reserve day set aside with forecast predicting heavy rain over the next 24 hours. The win by South Africa prevented a repeat of the 2006 summit clash between India and Pakistan and also dashed Pakistan's hopes of their third successive title in cricket's junior premier event. Needing 166 runs to win in 28.1 overs with eight wickets in hand today, Pakistan never got going from the first ball itself, with Bradley Barnes effecting a brilliant stumping of Umar Amin (22 overnight ) on the bowling of Pieter Malan. A second quick wicket, that of Ali Asad, who was adjudged leg-before to Roy Adams though the ball appeared to pitch outside the leg stump, worsened the situation for Pakistan before Ahmed Shehzad, 40 overnight, briefly kept their hopes alive. Delhi defeated Himachal Pradesh by eight wickets, Punjab beat Jammu and Kashmir by 37 runs while Haryana got the better of Services by 36 runs. The Punjab batting clicked to garner a healthy 259 for five in 50 overs at the Harbaksh stadium. Mayank Sidhana (62), Pankaj Dharmani (52) and Uday Kaul (51 not out) struck half-centuries, while Karan Goel contributed a useful 43. Samiullah Beg (61) and Zahoor Sofi (35) led the J-K run chase, but their efforts were not enough to overhaul the Punjab total. J-K managed 222 for eight in 50 overs as Manpreet Singh picked up three wickets for Punjab. At Palam ground, Haryana rode on impressive knocks by Amardeep Sonkar (73) and Sachin Rana (48) to reach 232 for seven in 50 overs. At Kotla: HP 160 for nine in 50 overs (Mukesh Sharma 84 not out, Parwinder Awana four for 30) lost to Delhi 163 for two in 35.2 overs (Shikhar Dhawan 70, Mayank Tehlan 45, Mithun Manhas 31 not out). At Palam: Haryana 232 for seven in 50 overs (Amardeep Sonkar 73, Sachin Rana 48) beat Services 196 in 47.3 overs (Tahir Khan 75, Soumik Chatterjee 45, Amardeep Sonkar three for 29, Amit Mishra three for 38). Randhawa turned in a four-under 68 studded with five birdies against a bogey in the penultimate round to take his total to 13-under 203. The local favourite trails sole leader and his tee off partner today, Taichiro Kiyota (67) of Japan, by one stroke. Randhawa, who has been playing non-stop for the past seven weeks, could have been atop the leaderboard but for an eventful par-five final hole. A rather aggressively hit drive landed in a non-playing area and Randhawa was given a free-drop. Although he did well to chip it back into the greens, the chance of picking up a shot and going into the lead had been blown away. But far from ruing it, Randhawa said he considered himself lucky to have got away by saving par after the disastrous drive. "I was a bit lucky. I hit two bad shots and was almost certain to get a bogey but managed to save par on the 18th. I messed up but recovered well. I hope I can be better tomorrow," he said. The local favourite also blamed his waywardness on the fatigue that has come with playing non-stop. Randhawa admitted that he was pushing his body hard. "Quite a few weeks have gone by. Your mind doesn't focus. But that's what I have learnt. I have never gone this far. I am pushing myself and enjoying. I will see how far my body and mind goes," Randhawa said. However, it was agony for Gaurav Ghei who carded a sensational seven-under 65 only to be disqualified later for a mistake made unknowingly yesterday. The Indian, who is now on six points, however, saw his lead being reduced to half a point as the 17-year-old Magnus Carlsen had a lucky victory over Alexei Shirov in a 80-move game, pushing Aronian to the third position.